Supreme Commander is a series real-time strategy computer games, the first of which was released in 2007. It was noted for its depth of scale — one can zoom from a single unit all the way up into orbit — as well as for being a very pure example of the RTS genre, focused less on resource-gathering and tactics than on logistics and strategy. The games are set in the 37th century, and have the player commanding a side in the "Infinite War", a thousand-year-long conflict between three irreconcilable human factions over control of the galaxy, fought mostly by robots. 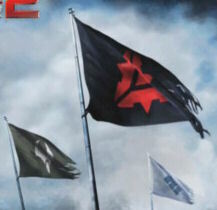 A print advertisement for 2010's Supreme Commander 2 showed the flags of the series' three factions. The United Earth Federation (UEF) is the centralist, somewhat authoritarian government of Earth. Its units in the game are identifiable by being predominantly blue, and are somewhat squarish and blocky; its emblem (and flag) follow this theme: a large square surrounded by five smaller squares to form an even larger square. The Aeon Illuminate are basically an intolerant new-age space cult. Its units are predominantly green, and are rounded and organic-looking; the Aeon emblem is the upper half of an ellipse, with an elliptical cut-out at its top and a smaller ellipse emerging from its bottom. On the flag, this is white on a green field. The Cybran Nation are rebellious cyborgs, considered subhuman by the UEF and abominations by the Aeon. Its units are predominantly red, and are spiky and jagged-looking; the Cybran emblem is a triangle nesting inside three pointy brackets making up a larger triangle. The flag has this in red on a black field.